Dr. Paul Joseph Goebbels, leader of the NSDAP's propaganda machine, later the minister in charge of all Nazi Propaganda and Hitler's successor as the Chancellor of Germany. Paul Joseph Goebbels (October 29, 1897 – May 1, 1945) was a German politician and Minister for Public Enlightenment and Propaganda during the National Socialist regime from 1933 to 1945. He was one of Adolf Hitler's closest associates and most devout followers. Goebbels was known for his zealous, energetic oratory and virulent antisemitism. Goebbels earned a Ph.D. from Heidelberg University in 1921, on the basis of a doctoral thesis on eighteenth century romantic drama. He then went on to work as a journalist and later a bank clerk and caller on the stock exchange. Goebbels came into contact with the Nazi Party in 1923, during the French occupation of the Ruhr and became a member in 1924. He was appointed Gauleiter (regional party leader) of Berlin. In this position, he put his propaganda skills to full use, combating the local socialist and communist parties with the help of Nazi papers and the paramilitary S.A. By 1928, he had risen in the party ranks to become one of its most prominent members. After the Nazis seized power in 1933, he was appointed propaganda minister. One of his first acts was to order the burning of books by Jewish or anti-Nazi authors at Bebelplatz. He proceeded to gain control of every important outlet of information in Germany. His attacks on German Jews became ever fiercer and culminated in the Kristallnacht in 1938, the first open and unrestrained pogrom unleashed by the Nazis. An early and avid supporter of war, Goebbels did everything in his power to prepare the German people for a large-scale military conflict. During the Second World War, he increased his power and influence through shifting alliances with other Nazi leaders. By late 1943, the war had turned into a disaster for the Axis powers, but this only spurred Goebbels to intensify the propaganda and urge the Germans to accept the idea of total war and mobilization. Goebbels remained with Hitler in Berlin to the very end, and following the Führer's suicide he served as the Third Reich's final Chancellor—albeit only for one day. In his final hours, Goebbels arranged for an SS doctor, Helmut Kunz, to kill their six young children. Shortly after, Goebbels and his wife both committed suicide. Goebbels was born in Rheydt, an industrial town south of Mönchengladbach on the edge of the Ruhr district. His family was Catholic. His father was a factory clerk and his mother had worked as a farmhand before marrying. He had four siblings. Goebbels was educated at a local grammar school, where he completed his graduation exams in 1916. Beginning in childhood, he had a deformed right leg, the result either of a club foot or osteomyelitis. He wore a metal brace and special shoe to compensate for his shortened leg, but walked with a limp all his life. The limp, along with his height (five feet, five inches), exposed him to ridicule and humiliation in a society that valued physical prowess. As a result of these conditions, he was rejected for military service in World War I, which he bitterly resented. Goebbels compensated for his physical frailty with intellectual accomplishments. He intended on training to be a priest, but after growing distant from his Catholic faith, he studied literature and philosophy at universities in Bonn, Würzburg, Freiburg im Breisgau, and Heidelberg, where he wrote his doctoral thesis on the eighteenth century romantic novelist Wilhelm von Schütz. His two most influential teachers, Friedrich Gundolf and his doctoral supervisor at Heidelberg, Max Freiherr von Waldberg, were Jews. His intelligence and political astuteness were generally acknowledged by his teachers and peers. The British anti-semite Houston Stewart Chamberlain was a major influence on Goebbels. In the early 1920s, Goebbels worked as a bank clerk and a caller on the stock exchange. During this period, he read avidly and formed his political views. Major influences included Friedrich Nietzsche, Oswald Spengler, and most importantly, Houston Stewart Chamberlain, the British-born German writer who was one of the founders of “scientific” anti-Semitism and whose book, The Foundations of the Nineteenth Century (1899), was one of the standard works of the extreme right in Germany. Goebbels spent the winter of 1919–20 in Munich, where he witnessed and admired the violent nationalist reaction against the attempted communist revolution in Bavaria. His first political hero was Anton Graf von Arco auf Valley, the man who assassinated the Munich socialist leader Kurt Eisner. After completing his doctorate in 1921, Goebbels worked as a journalist and tried for several years to become a published author. He wrote a semi-autobiographical novel, Michael, two verse plays, and quantities of romantic poetry. Goebbel's literary career, however, was a source of frustration for him. His novel did not find a publisher until 1929, and his plays were never staged. He found an outlet for his desire to write in his diaries, which he began in 1923, and continued for the rest of his life. His diaries reveal a long succession of affairs, both before and after his marriage, in 1931, to Magda Quandt, with whom he had six children. Like others who were later prominent in the Third Reich, Goebbels came into contact with the Nazi Party in 1923, during the campaign of resistance to the French occupation of the Ruhr. But Hitler’s imprisonment following the failed November 1923 “Beer Hall Putsch” left the party temporarily leaderless, and when the 27 year old Goebbels joined the party in late 1924, the most important influence on his political development was Gregor Strasser, who became a Nazi organizer in northern Germany in March 1924. Gregor Strasser, leader of the Nazi Party's socialist faction who was later put to death by orders from Adolf Hitler. Hitler, however, recognized Goebbels’s talents, and he was a shrewd judge of character, sensing that Goebbels craved recognition above all else. In April, he brought Goebbels to Munich, sending his own car to meet him at the station, and gave him a long private audience. Hitler berated Goebbels over his support for the “socialist” line, but offered to “wipe the slate clean” if Goebbels would now accept his leadership. Goebbels capitulated completely, offering Hitler his total loyalty, a pledge which he adhered to until the end of his life. In the autumn of 1926, Hitler rewarded Goebbels for his new loyalty by making him Gauleiter of Berlin, the capital of Germany, but in the 1920s a stronghold of the socialists and communists. Here Goebbels developed his genius as a propagandist, and was also able to indulge his heretofore latent taste for violence, if only vicariously. History, he said, “is made in the street,” and he was determined to challenge the dominant parties of the left—the Social Democrats and Communists—in the streets of Berlin. Working with the local S.A. stormtrooper leaders, he deliberately provoked beer-hall battles and street brawls, frequently involving firearms. He was editor of the Berlin Nazi newspaper, Der Angriff (The Attack), and the author of a steady stream of Nazi posters and handbills. Among his favorite targets were socialist leaders such as Hermann Müller and Carl Severing, and the Jewish Berlin Police President, Bernhard Weiss, whom he subjected to a relentless campaign of Jew-baiting. The Social Democrat city government reacted in 1927, with an eight-month ban on the Nazi Party, which Goebbels exploited to the hilt. Goebbels also discovered a talent for oratory, and was soon second in the Nazi movement only to Hitler as a public speaker. Where Hitler’s style was hoarse and passionate, Goebbels’s was cool, sarcastic, and often humorous: He was a master of biting invective and insinuation, although he could whip himself into a rhetorical frenzy if the occasion demanded. Unlike Hitler, however, he retained a cynical detachment from his own rhetoric. At the 1928 Reichstag elections, the Nazis polled less than two percent of the vote in Berlin compared with 33 percent for the Social Democrats and 25 percent for the Communists. However, Goebbels was one of the ten Nazis elected to the Reichstag, which brought him a welcome salary of 750 Reichsmarks a month and immunity from prosecution. By 1928, still only 31 years old, he was acknowledged to be one of the inner circle of Nazi leaders. In April 1930, Hitler sacked Gregor Strasser as head of the Nazi Party national propaganda apparatus and appointed Goebbels to replace him, giving him control of the party’s national newspaper, the Völkischer Beobachter (People’s Observer), as well as other Nazi papers across the country. Despite his revolutionary rhetoric, Goebbels’s most important contribution to the Nazi cause between 1930 and 1933 was as the organizer of successive election campaigns: The Reichstag elections of September 1930, July and November 1932, and March 1933, and Hitler’s presidential campaign of March–April 1932. He proved to be an organizer of genius, choreographing Hitler’s dramatic airplane tours of Germany and pioneering the use of radio and cinema for electoral campaigning. The Nazi Party’s use of torchlight parades, brass bands, massed choirs, and similar techniques caught the imagination of many voters, particularly young people. Although the spectacular rise in the Nazi vote in 1930 and July 1932 was caused mainly by the effects of the Depression, Goebbels as party campaign manager was naturally given much of the credit. In 1933, when Goebbels was chief of propaganda for the party, the Nazis burned works of Jewish authors and other works considered "un-German" in Berlin. When Hitler was appointed Reich Chancellor of Germany on January 30, 1933, Goebbels was initially given no office: The coalition cabinet which Adolf Hitler headed contained only a minority of Nazis as part of the deal he had negotiated with President Paul von Hindenburg and the conservative parties. But as the propaganda head of the Nazi party, Goebbels commandeered the state radio to produce a live broadcast of the torchlight parade which celebrated Hitler’s assumption of office. On March 13, Goebbels was rewarded for his part in bringing the Nazis to power by being appointed Reich Minister for Popular Enlightenment and Propaganda (Volksaufklärung und Propaganda), with a seat in the Cabinet. The role of the new ministry, which took over the palatial accommodation in the eighteenth century Leopold Palace on Wilhelmstrasse, just across from Hitler’s offices in the Reich Chancellery, was to centralize Nazi control of all aspects of German cultural and intellectual life, particularly the press, the radio and the visual and performing arts. On May 1, Goebbels organized the massive demonstrations and parades to mark the "Day of National Labor," which preceded the Nazi takeover and destruction of the German trade union movement. Goebbels soon established bureaucracies within his ministry dealing with press, radio, film, theater, music, literature, and publishing. In each of these, a Reich Chamber (Reichskammer) was established, co-opting leading figures from the field to head each Chamber, and requiring them to supervise the purge of Jews, socialists and liberals, as well as practitioners of “degenerate” art forms such as abstract art and atonal music. The respected composer Richard Strauss, for example, became head of the Reich Music Chamber. Goebbels’s orders were backed by the threat of force. Many prominent Jews in the arts and the mass media emigrated in large numbers, as did many socialists and liberals. Soon the content of every newspaper, book, novel, play, film, broadcast, and concert—from the level of nationally known publishers and orchestras to local newspapers and village choirs—was subject to supervision by the Propaganda Ministry. As a result, a process of self-censorship was soon effectively operating in all these fields, leaving the Ministry in Berlin free to concentrate on the most politically sensitive areas such as major newspapers and the state radio. No author could publish, no painter could exhibit, no singer could broadcast, no critic could criticize, unless they were a member of the appropriate Reich Chamber, and membership was conditional, based on good behavior. However, Goebbels became to some extent the protector of the arts as well as their regulator. In this, he had the support of Hitler, a passionate devotee of Richard Wagner. However, Hitler loathed modernism of all kinds, and Goebbels, whose own tastes were sympathetic to modernism, was forced to acquiesce in imposing traditionalist forms on the artistic and musical worlds. The music of Paul Hindemith, for example, was banned only because Hitler did not like it. Goebbels also resisted the complete Nazification of the arts, knowing that the masses must be allowed some respite from slogans and propaganda. He ensured that film studios such as UFA at Babelsberg near Berlin continued to produce a stream of comedies and light romances, which drew mass audiences to the cinema where they would also watch propaganda newsreels and Nazi epics. He resisted pressure from Nazi xenophobes to ban all foreign films—helped by the fact that Hitler enjoyed Walt Disney's Mickey Mouse. Despite the enormous power of the Propaganda Ministry over German cultural life, Goebbels’s status began to decline once the Nazi regime was firmly established in power. This was because the real business of the Nazi regime was preparation for war. Goebbels soon developed a new role for himself as the regime’s leading Jew-baiter. Goebbels had once mocked the “primitive” anti-semitism of Nazis such as Julius Streicher. Now, however, Goebbels took every opportunity to attack the Jews. In his capacity as Gauleiter of Berlin, Goebbels maintained constant pressure on the city’s large Jewish community, forcing them out of business and professional life and placing obstacles in the way of their being able to live normal lives, such as banning them from public transport and city facilities. There was some respite during 1936, while Berlin hosted the Olympic Games, but from 1937, the intensity of his antisemitic words and actions began to increase again. “The Jews must get out of Germany, indeed out of Europe altogether,” he wrote in his diary in November 1937. “That will take some time, but it must and will happen.” By mid 1938, Goebbels was investigating the possibility of requiring all Jews to wear an identifying mark and of confining them to a ghetto, but these were ideas whose time had not yet come. In November 1938, a Jewish youth, Herschel Grynszpan, shot a German diplomat in Paris, Ernst vom Rath, in revenge for the deportation of his family to Poland and the persecution of German Jews generally. On November 9, vom Rath died of his wounds. With Hitler's approval Goebbels organized a massive, nationwide pogrom against the Jews. The result of Goebbels’s incitement was Kristallnacht, the “Night of Broken Glass,” during which the S.A. and Nazi Party went on a rampage of anti-Jewish violence and destruction, killing between at least 90 and 200 people, destroying over a thousand synagogues and hundreds of Jewish businesses and homes, and forcing some 30,000 Jews into concentration camps, where at least another thousand died before the remainder were released after several months of brutal treatment. The longer-term effect was to drive 80,000 Jews to emigrate, most leaving behind all their property in their desperation to escape. Foreign opinion reacted with horror, bringing to a sudden end the climate of appeasement of Nazi Germany in the western democracies. These events were well-timed from the point of view of Goebbels’ relations with Hitler. In 1937, their relationship had been damaged as the result of Goebbels' affair with Czech actress Lída Baarová. Hitler was a conservative in sexual matters and ordered Goebbels to break off his affair, leading to a suicide attempt by Goebbels. Nevertheless, he remained one of Hitler’s intimates. He had also become a wealthy man, and continued his womanizing despite being forced to send away his lover Baarova. Since his offices were close to the Chancellery, he was a frequent guest for lunch. In the months leading up to the war, his influence began to increase again. He ranked along with Joachim von Ribbentrop, Göring, Himmler, and Martin Bormann as the senior Nazi with the most access to Hitler. 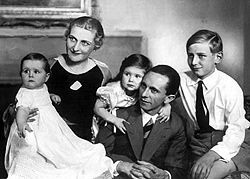 The fact that Hitler was fond of Magda Goebbels and the children also gave Goebbels entrée to Hitler’s inner circle. The Goebbelses were regular visitors to Hitler’s Bavarian mountain retreat, the Berghof. However, Goebbels was not kept directly informed of military and diplomatic developments, relying on second-hand accounts to hear what Hitler was doing. Goebbels was one of the most enthusiastic proponents of aggressively pursuing Germany's territorial claims sooner rather than later, along with Heinrich Himmler and Foreign Minister von Joachim Ribbentrop. He saw it as his job to make the German people accept this and if possible welcome it. At the time of the Sudetenland crisis in 1938, Goebbels was well aware that the great majority of Germans did not want a war, and used every propaganda resource at his disposal to overcome what he called this "war psychosis," by whipping up sympathy for the Sudeten Germans and hatred of the Czechs. After the western powers conceded to Hitler's demands concerning Czechoslovakia in 1938, Goebbels soon redirected his propaganda machine against Poland. From May onwards, he orchestrated a hate campaign against the Poles, fabricating stories about atrocities against ethnic Germans in Danzig and other cities. Even so, he was unable to persuade the majority of Germans to welcome the prospect of war. Once the war began in September 1939, Goebbels began a steady process of extending his influence over domestic policy. After 1940, Hitler made few public appearances, and even his broadcasts became less frequent, so Goebbels increasingly became the face and the voice of the Nazi regime for the German people. With Hitler preoccupied with the war, Himmler focusing on the final solution to the Jewish question in eastern Europe, and with Hermann Göring’s position declining with the failure of the Luftwaffe, Goebbels sensed a power vacuum in domestic policy and moved to fill it. Since civilian morale was his responsibility, he increasingly concerned himself with matters such as wages, rationing, and housing, which affected morale and therefore productivity. He came to see the lethargic and demoralized Göring, then head of the Four Year Plan Ministry, as his main enemy. To undermine Göring, he forged an alliance with Himmler, although the SS chief remained wary of him. A more useful ally was Albert Speer, a Hitler favorite who was appointed Armaments Minister in February 1942. Goebbels and Speer worked through 1942, to persuade Hitler to dismiss Göring and allow the domestic economy to be run by a revived Cabinet headed by themselves. The crushing German defeat at the Battle of Stalingrad in January 1943, however, produced a crisis in the regime. Goebbels was forced to ally himself with Göring to thwart a bid for power by Martin Bormann, head of the Nazi Party Chancellery, who was also Secretary to the Führer. Goebbels tried to persuade Hitler to appoint Göring as head of the government. His proposal had a certain logic, as Göring was still very popular among the German people. However, this proposal was doomed to failure. In February, Goebbels launched a new effort to place himself at the center of policy-making. In a passionate speech at the Berlin Sportpalast, Goebbels demanded from his audience a commitment to “total war,” the complete mobilization of the German economy and German society for the war effort. He hoped in this way to persuade Hitler to give him control of domestic policy for a program of total commitment to arms production and full labor conscription, including of women. But Hitler, supported by Göring, resisted these demands. Goebbels privately lamented “a complete lack of direction in German domestic policy,” but could not directly criticize Hitler or go against his wishes. The view of most historians is that the decision to proceed with the extermination of the Jews was taken at some point in late 1941, and Goebbels’ comments make it clear that he knew in general terms, if not in detail, what was planned. During 1942, Goebbels continued to press for the “final solution to the Jewish question” to be carried forward as quickly as possible now that Germany had occupied a huge swath of Soviet territory into which all the Jews of German-controlled Europe could be deported. There, they could be worked into extinction in accordance with the plan agreed on at the Wannsee Conference convened by Heydrich in January. It was a constant annoyance to Goebbels that, at a time when Germany was fighting for its life on the eastern front, there were still 40,000 Jews in Berlin. For Goebbels, 1943 and 1944 were years of struggle to rally the German people behind a regime which was increasingly obviously facing military defeat. Goebbels and Speer were among the few Nazi leaders who were under no illusions about Germany’s dire situation. Following the Allied invasion of Italy and the fall of Benito Mussolini, Goebbels and Ribbentrop raised with Hitler the possibility of secretly approaching Josef Stalin and negotiating a separate peace behind the backs of the western Allies. Hitler, surprisingly, did not reject the idea of a separate peace with either side, but he told Goebbels that he should not negotiate from a position of weakness. As Germany’s military and economic situation grew steadily worse during 1944, Goebbels renewed his push, in alliance with Speer, to wrest control of the home front away from Göring. In July, following the Allied landings in France and the Soviet advances in Byelorussia, Hitler finally agreed to grant both Goebbels and Speer increased powers. Speer took control from Göring of economic and production matters, and Goebbels took the title Reich Plenipotentiary for Total War. At the same time, Himmler took over the Interior Ministry. This trio—Goebbels, Himmler, and Speer—became the real center of German government in the last year of the war. Goebbels promised Hitler that he could raise a million new soldiers by means of a reorganization of the Army, transferring personnel from the Navy and Luftwaffe. However, by July 1944, it was already too late for Goebbels and Speer to make any real difference to the outcome of the war. The combined economic and military power of the Allies and the Soviet Union was simply too great for Germany to overcome. This, combined with the U.S. air campaign against Germany’s synthetic oil production, finally broke the back of the German economy. By this time, the best Goebbels could do to reassure the German people that victory was still possible was to make vague promises that “miracle weapons,” such as the Messerschmitt Me-262 jet airplane, the German Type XXI submarine, and the V-2 rocket, could somehow retrieve the military situation. Goebbels lamented privately that Hitler had cut himself off from the people. Meanwhile, Goebbels, himself, became the public voice of the Nazi regime, both in his regular broadcasts and his weekly editorials in Das Reich. In public, Goebbels remained confident of German victory, but in private, he was discouraged. By the beginning of 1945, with the Soviets on the Oder and the western Allies crossing the Rhine, Goebbels could no longer disguise the fact that defeat was inevitable. He knew what that would mean for himself: "For us," he had written in 1943, "we have burnt our bridges. We cannot go back, but neither do we want to go back. We are forced to extremes and therefore resolved to proceed to extremes." When other Nazi leaders urged Hitler to leave Berlin and establish a new center of resistance in the so-called National Redoubt in Bavaria, Goebbels opposed this, arguing for a last stand in the ruins of the Reich capital. Unlike many other leading Nazis at this juncture, Goebbels at least proved to have the courage of his convictions, moving himself and his family into the Führerbunker under the Reich Chancellery building in central Berlin. He told Vice-Admiral Hans-Erich Voss that he would not entertain the idea of either surrender or escape: "I was the Reich Minister of Propaganda and led the fiercest activity against the Soviet Union, for which they would never pardon me," Voss quoted him as saying. "He couldn't escape also because he was Berlin's defense Commissioner and he considered it would be disgraceful for him to abandon his post," Voss added. On April 30, with the Russians advancing to within a few hundred yards of the bunker, Hitler dictated his last will and testament, to which Goebbels was one of four witnesses. Not long after completing it, Hitler shot himself. Of Hitler's death, Goebbels commented: "The heart of Germany has ceased to beat. The Führer is dead." In his will, Hitler named no successor as Führer or leader of the Nazi Party. Instead, Hitler appointed Goebbels as Reich Chancellor, Grand Admiral Karl Dönitz as Reich President, and Martin Bormann as Party Minister. Goebbels knew that this was an empty title and had no intention of trying to escape and assume his new duties. On May 1, within hours of Hitler's suicide, Goebbels completed his sole official act as Chancellor of Germany. He dictated a letter and ordered General Hans Krebs to meet under a white flag with General Vasily Chuikov, the commander of the Soviet forces in central Berlin, and to deliver his letter. Goebbels informed Chuikov of Hitler's death and requested a ceasefire, hinting that the establishment of a National Socialist government hostile to Western Plutocracy would be beneficial to the Soviet Union. When this was rejected, Goebbels decided that further efforts were futile. Later in the day, Vice-Admiral Hans-Erich Voss saw Goebbels for the last time: "Before the breakout [from the bunker] began, about 10 generals and officers, including myself, went down individually to Goebbels's shelter to say goodbye. While saying goodbye I asked Goebbels to join us. But he replied: 'The captain must not leave his sinking ship. I have thought about it all and decided to stay here. I have nowhere to go because with little children I will not be able to make it.'" The partly burned corpse of Joseph Goebbels, photographed by the Soviet secret service in May 1945. At 8 p.m. on the evening of May 1, Goebbels arranged for an SS doctor, Helmut Kunz, to kill his six children by injecting them with morphine and then, when they were unconscious, crushing an ampule of cyanide in each of their mouths. Shortly afterwards, Goebbels and his wife went up to the garden of the Chancellery, where they killed themselves. The bodies of Goebbels and his wife were then burned in a shell crater, but owing to the lack of gasoline, the burning was only partly effective, and their bodies were easily identifiable. The remains of the Goebbels family were secretly buried, along with those of Hitler, near Rathenow in Brandenburg. In 1970, they were disinterred and cremated, and the ashes thrown in the Elbe. Often portrayed during and immediately after WWII as a "malicious dwarf" and evil mastermind, today Joseph Goebbels is generally perceived as having been a brutal, ruthless, amoral, and ambitious character. As propaganda minister, he was one of the earliest promoters of the "Final Solution" against the Jewish population of Europe. Using his zealous, energetic oratory and virulent anti-Semitism, he fanned the flames of bigotry in Germany in order to unite those sympathetic with the Nazi cause. In doing so, he left a legacy of evil, supporting Hitler's power hold on his countrymen, while he helped create a culture of superiority, racism, and hatred that ultimately helped lead to the deaths of millions of people and the destruction of his nation. History will remember Joseph Goebbels as ordering the burning of books, choreographing the huge Hitler rallies, calling for the pogrom of Kristallnacht, preparing the German people psychologically for the war to come, and fanning the flames of hatred with his cynical, fanatical oratory. ↑ Fest, The Face of the Third Reich, 89. ↑ Ian Kershaw, Hitler, I, 275. ↑ Evans, The Third Reich in Power, 575. ↑ Kershaw, Hitler, II, 482. ↑ Fest, "The Face of the Third Reich, 96. ↑ V.K. Vinogradov et al., Hitler's Death: Russia's Last Great Secret from the Files of the KGB (Chaucer Press), 154. ↑ Vinogradov, Hitler's Death, 156. Fest, Joachim C. The Face of the Third Reich: Portraits of Nazi Leadership. Da Capo Press, 1999. ISBN 978-0306809156. Goebbels, Joseph. The Goebbels Diaries, 1942-1943. Greenwood Press, 1970. ISBN 978-0837138152. Roberts, Jeremy. Joseph Goebbels: Nazi Propaganda Minister. Rosen Publishing Group, 2000. ISBN 978-0823933099. Trevor-Roper, Hugh. Final Entries 1945: The Diaries of Joseph Goebbels. G.P. Putnam's Son, 1978. ISBN 978-0399121166. Nazi Propaganda by Joseph Goebbels. www.calvin.edu. Nazi Sozi a pre-1933 pamphlet. In English. www.archive.org.